A fairy garden can be a fun and whimsical addition to your gardening, whether you plan one to be tucked into your landscape, showcased on a deck or patio or even nestled alongside your houseplants. 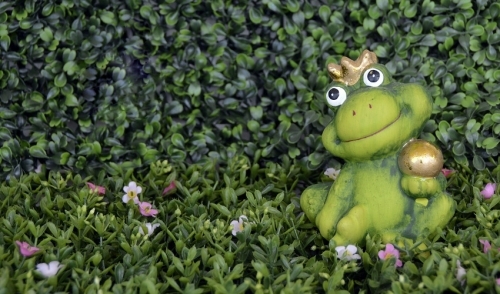 But what is a fairy garden, and how can you create your very own piece of this magical world? Fairy gardens are miniature gardens or landscapes complete not only with living, growing plants, but also with structures, accents and decorations that create a detailed scene. Think of a fairy garden as a cross between a bonsai, dollhouse and terrarium, and you've got the general idea, though there is no wrong way to design a fairy garden. These intricate scenes are believed to bring good luck and happiness to a space as they attract the magic of fairies and sprites. Introduce children to container gardening in a fun and engaging way. Spark creativity, mental stimulation and imagination in all ages. Incorporate gardening into a downsized space that may not have room for larger landscaping. Bring gardening indoors for year-round enjoyment in any climate. Add living decorative accents to a home and enhance feelings of calm and wellness. A fairy garden can be anything you imagine it to be, and could have any style, shape or design you are interested in. There are certain basics of design, however, that should be followed to be sure your fairies have a healthy, beautiful home. Container Most fairy gardens are designed in containers, though it is possible to position a small fairy garden area under a hosta leaf, beneath a shade tree or in another protected area of an outdoor landscape. Any container can become a fairy garden, including pots, window boxes, baskets, terrariums, dry bird baths, wine barrels or hollow tree stumps. For mobile gardens, consider planning a fairy garden in a wheelbarrow or wagon, or for larger designs, use an old canoe, bathtub or kiddie pool. Plants Because fairy gardens are typically small, miniature plants are the best options for lush growth that won't overwhelm the scene. Mosses, ferns, flowers, groundcovers, succulents and bonsai trees are all fantastic options, but be sure to choose plants with similar soil and watering needs so they can be cared for easily. Provide drainage in your fairy garden, and use an appropriate potting soil to meet the plants' needs. Layout A fairy garden is a miniature landscape and should be complete with open spaces and pathways. This will also provide room for accents and accessories to be added to the scene without crowding plants. The openness of the layout will also ensure proper air circulation around small plants to keep them healthy, and will allow for easier watering and care to keep the garden always looking its best. Design the fairy landscape just as you would your own yard, with groups of plants, borders and an aesthetically pleasing flow. Accents Tiny accessories are what make a fairy garden special. Your garden can look like any type of small scene, such as a cottage garden with a mini bird bath and white picket fence, or a wilder hobbit-like grove with mossy boulders and a rustic door. Chairs, benches or swings give fairies places to sit and relax, while koi ponds, toadstools, a wishing well, a tiny bridge or even a mailbox are fun accents. Bring color to the scene with colored gravel or marbles, and even add height with a tiny arbor or trellis. Many garden centers have fairy garden accessories to choose from, or visit craft stores to look at doll house supplies for more ideas. Care A fairy garden is no more challenging to care for than any container, so long as you keep in mind how tiny the plants are and do not overwater. Use small tools to keep the plants trimmed as needed, and provide proper fertilization when necessary to help your garden grow. Periodically remove the accessories and clean them to keep dust, pollen and dirt from accumulating, and your garden will always look fresh and lovely. Entering your garden in local shows or competitions through gardening groups. Creating an entire village with different scenes and personalities in each garden. Rearranging your garden periodically to give it new life and enjoy different views. Add seasonal and holiday accents throughout the year to celebrate with the fairies. Using your garden as a setting for storytelling or other creative fun with children or grandchildren. Once you've learned the basics of fairy gardening, you'll quickly learn that there are no limits to how much fun this type of creative gardening can be.